Julia Roberts Takes on The Evil Queen Role In “The Brothers Grimm: Snow White”!!! Yes, Julia Roberts will play a villain in the upcoming “The Brothers Grimm: Snow White” film which will be directed by the talented Tarsem Singh. Tarsem is known for directing “The Cell” and “The Fall”. He is one excellent visual director. This film has a release date in 2012. 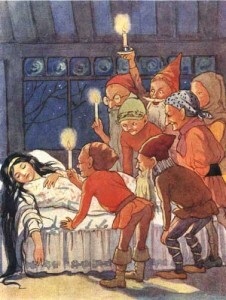 Now this is not the only Snow White film to be coming out in 2012. There is another Snow White project called “Snow White and the Huntsman” with Kristen Stewart and Viggo Mortensen as the Huntsman. Rupert Sanders will direct that film. Rupert really has not done much, but his website is BADASS and he has done tons of commercials you have probably seen. But I am very curious and excited to see a Snow White film done by Tarsem. It is going to be beautiful and haunting on a level which I can’t begin to imagine. Now I wonder who they have in mind to play Snow White or The Seven Dwarfs. It will be interesting to see these two films go head to head in one year. Personally I would love to see Selma Blair, Anne Hathaway, or Jaime King play Snow White. Check Out the New Extended Trailer for ‘Snow White and The Huntsman’!!! See The First Images of ‘Snow White and the Huntsman’ That Debuted at Comic Con 2011!!! This entry was posted on Wednesday, February 9th, 2011 at 1:05 pm	and is filed under Film, News. You can follow any responses to this entry through the RSS 2.0 feed. You can skip to the end and leave a response. Pinging is currently not allowed. « New Tom & Jerry DVD Is Out With 14 Fur Flying Adventures!! !